Find your hair soft, smooth and bouncy after you rinse it with the Redken All Soft Shampoo. 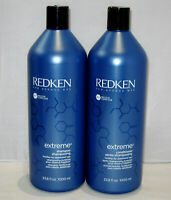 This Redken shampoo is formulated with Interbond Conditioning System and Silk-Luxe Complex. The complex in this deep cleansing shampoo contains a blend of four ingredients, including Gold Camelina and Avocado Oil that provide shine and softness respectively. The other two ingredients used in this Redken shampoo are Olive Oil - for conditioning - and Silk Amino Acid - for strengthening your tresses. The makers say that this deep cleansing shampoo conditions and nourishes dry and brittle hair to give you desirable silky locks. Ultra-manageable and voluminous hair will greet you when you use the Redken All Soft Shampoo.